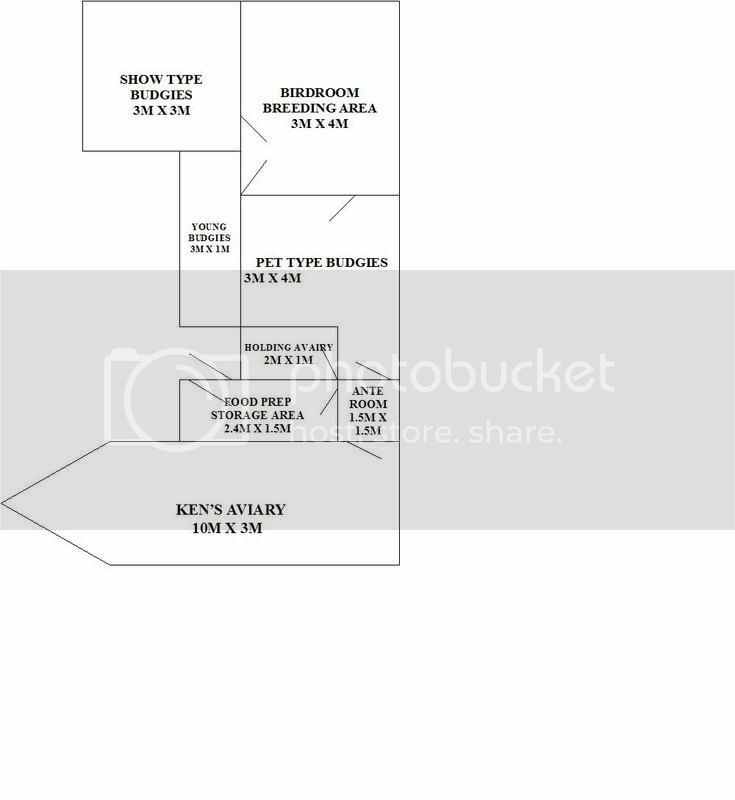 Here is a floorplan of my aviary. It is a work in progress. The newest area is the bird room breeding area. We have just fitted lights on timer switches, low wattage lights for night frights, power for vacuuming, air coolers, etc. Have yet to tile the floor in the birdroom, insulate the walls and line them with ply. Looks like you have plenty of room there! Can you post pics of each section so we can see? Looks great Kaz. How are you going with the breeding cages? Oh.. can I ask what sort? your husband sounds just like mine kaz, i am wanting to buy some breeding cabinets and my husband wants to make them for me instead but he has no time so i cannot do any breeding yet. i am getting impatient like you and thinking about just going and buying some and give up waiting for him to get around to making them. that is good that your plans are going ahead. My hubby is just the same too :hap: - good intentions, but not enough time to get it ALL done. I am really excited for you. your plans look amazing!!!!!! I'm very jealous!!! Looks great Kaz...Good on you for going ahead without Ken Mite give him the boot up the bum he needs :hap: Now all he needs is the time... mmmmmmm sounds familar! The plan was always to get a contractor to do the building part as Ken is no good with getting things level or straight. But He decided he would be the one to prep the site and do the concrete base. Six months later still not done, so I will pay to have that part done. The new birdroom will have plumbing and a sink for washing up birdfood dishes etc. All new breeding cages. that is great the work has started for you,hope it does not take too long before it is finished.